One day in 1987, while skeptically listening to a Lummi woman speak of God's loving presence in her life, it occurred to me that a person doesn't have to believe in God to order to believe that another person not only believes in God but has had the experience of feeling loved by that presence they refer to as "God." Just now, in an email from Daily Celebrations, I learned that Martin Luther King, Jr. and Etty Hillesum share the same birthdate. Today. January 15. Etty Hillesum was born in 1914. Martin Luther King, Jr. was born in 1929. She said, "One must also accept that one has 'uncreative' moments. her death two years later. "We should be willing to act as a balm for all wounds," she observed. passionately celebrated life, the human spirit and the power of love. ~Give yourself a moment's breath. 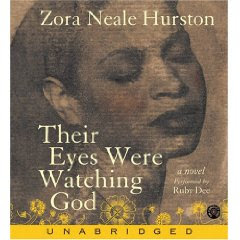 Ruby Dee does an extraordinary reading of Zora Neale Hurston's novel, THEIR EYES WERE WATCHING GOD.